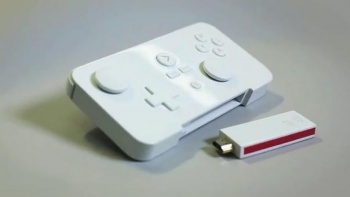 The tiniest console managed to raise $146,000 of its $100,000 Kickstarter goal within a few days. The console on a stick will get made, thanks to a Kickstarter campaign that raised $146,000+ in the first few days, beating its $100,000 target handily. If you're not familiar with GameStick, take a look at the picture. That USB stick you're looking at is the console; it plugs right into the HDMI slot on your TV, for truly mobile gaming. "Using Android [Jelly Bean] as the underlying operating system gives us access to all the innovation and content within the mobile, tablet and now PC world," say the PlayJam team behind GameStick, and 200 games have already been identified as working well with the GameStick concept, many of which will be free to play. The GameStick isn't built to beat the Xbox at its own game, nor is that what PlayJam wants. "We want to make publishing affordable games to TV as easy as it is on mobile," says PlayJam, "it's what we live and breathe." The same game you'd pay a few bucks for to play on your phone, now becomes something you can plug into your TV. â€¢	Content Download Manager w/ cloud storage for games. â€¢	Controller - Bluetooth, 3 mode controller: gamepad, mouse and keyboard with support for up to 4 controllers. There's still 27 days to go on the campaign; plenty of time to get in on the ground floor. UPDATE:: one of the project's backers has gotten in touch. Apparently the GameStick is the subject of an intellectual property dispute - no idea what the basis of the dispute is, as yet - and as a result, the Kickstarter campaign is on hold. Backers are being advised to contact GameStick directly. If the dispute isn't resolved within 30 days, the Kickstarter will be permanently offline. My thanks to Vault Citizen for the tip! UPDATE 2: According to GameStick the issue has to do with one of the videos used to promote the device. Apparently it included images of someone's game, and the someone hadn't signed off on it being used as Kickstarter promo material. An edited video should solve the problem, GameStick hopes.